Pioneers in the industry, we offer alpha beta arteether, artemether injection, alpha beta arteether injection, artemether lumefantrine tablets, alpha beta arteether 150 mg and antimalarial injection from India. Alpha-Beta Arteether is a fast acting blood schizonticidal agent for P. falciparum malaria at the erythrocytic stage. ?-? Arteether is concentrated in parasitized erytrocytes. The functional group responsible for antimalarial activity of Alpha-Beta Arteether is endoperoxide bridge which inhibits the protein synthesis and alters the ribosomal organization and endoplasmic reticulum. Severe malaria including cerebral malaria & as a second line drug in chloroquine resistant malaria cases only. 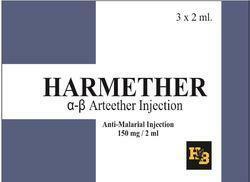 Alpha-Beta Arteether injection is contraindicated in patients hypersensitive to artemisinin derivatives. Treatment of slide-confirmed severe falciparum malaria in areas where there is evidence that quinine is ineffective. Radical cure should then be effected with a full dose of an effective oral antimalarial such as mefloquine. Adults and children over 6 months: 3.2 mg/kg as a loading dose by intramuscular injection, followed by 1.6 mg/kg daily until the patient is able to tolerate oral medication or for a maximum of 7 days. 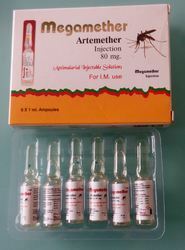 Artemether should be used for the treatment of severe falciparum malaria only where there is evidence that the antimalarial efficacy of quinine is declining. Little experience has been gained with the use of this drug in pregnancy but it should not be withheld if it is considered life-saving to the mother. The oily preparation should be stored in tightly closed containers, protected from light. To put into action our exclusive market and business plannings, we are readily engaged as manufacturer, supplier and exporter of Artemether Lumefantrine Tablets in Ahmedabad, Gujarat, India. Tiotem is used for: Treating certain types of malaria in adults and children who weigh at least 11 pounds (5 kg). It may also be used for other conditions as determined by your doctor. Tiotem is used for Treating certain types of malaria in adults and children who weigh at least 11 pounds (5 kg). It may also be used for other conditions as determined by your doctor. 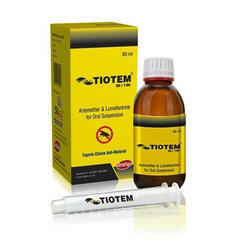 How to use Tiotem Use Tiotem as directed by your doctor. Check the label on the medicine for exact dosing instructions. Proper storage of Tiotem Store Tiotem at room temperature, between 59 and 86 degrees F (15 and 30 degrees C). Store away from heat, moisture, and light. Do not store in the bathroom. Keep Tiotem out of the reach of children and away from pets. 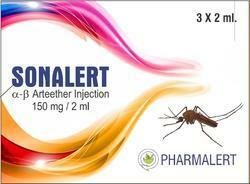 Antimalarials are drugs which are used for prophylaxis, treatment & prevention of Malaria. 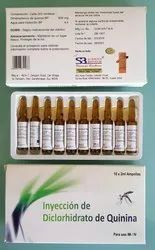 They are used for treatment of Malaria in individuals with suspected or confirmed infection and for prevention of infection in individuals visiting a malaria-endemic region who have no immunity (prophylaxis). 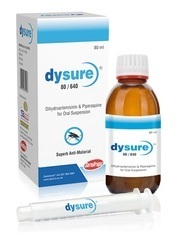 Dihydroartemisinin + Piperaquine Phosphate Oral Suspension is an oral fixed-dose artemisinin-based Combination antimalarial and antiprotozoal agent. This combination therapy is used for treatment of all forms of malaria, including those caused by multi drug-resistant strains. 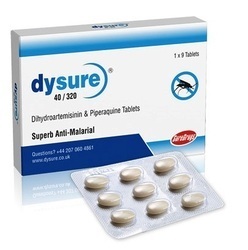 Dihydroartemisinin + Piperaquine Phosphate is indicated for the treatment of various types of malaria including chloroquine-resistant P. falciparum and P.
Dihydroartemisinin+ Piperaquine Phosphate Tablets are an oral fixed-dose artemisinin-based Combination antimalarial and antiprotozoal agent. This combination therapy isused for treatment of all forms of malaria, including those caused by multidrug-resistant strains. Dihydroartemisinin + Piperaquine Phosphate is indicatedfor the treatment of various types of malaria including chloroquine-resistantP. falciparum and P. vivax. INDICATIONS: For the treatment of acute attacks of malaria, including attacks due to strains of Plasmodium falciparum resistant to chloroquine or resistant to multiple drugs. Quinine is used parenterally for cerebral malaria, severe or complicated, or when Vomitosevitan retention of a drug administered orally. 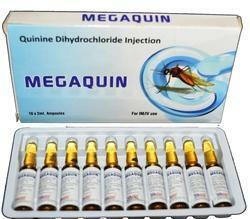 Quinine dihydrochloride is the salt that is generally used for the preparation of injections.